Agaves and yuccas are beautiful ornamental plants that are often used to accent xeriscape gardens. For the most part, they do not have serious pest problems. However, it’s fairly common for them to become infected with agave snout. What is Agave Snout Weevil? The agave snout weevil (Scyphophorus acupunctatus) adult measures about 1/2-inch long, has a dull brownish-black body and a characteristic long snout. The adult females chew their way into the agave plant base and lay their eggs while also introducing microorganisms that cause decay. These eggs hatch into legless grubs that have a cream-colored body and dark head. The larvae feed, burrowing further into the decaying agave before pupating and emerging as adults, which then spread to infect nearby agaves and sometimes yuccas. The entire agave snout weevil life cycle can be completed in 60 to 90 days. Agave snout weevil feeding may not be apparent until damage is already very extensive. Small holes may first be visible at the base of the agave. 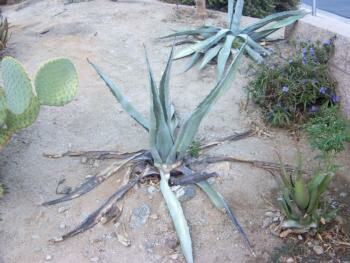 The plant will collapse rapidly, with its lowest leaves shriveling first. The center of the agave may have an unpleasant odor and the specimen may be loose and wiggle easily if tugged. Agave plants that are weak or about to flower are especially vulnerable. The agave snout weevil can attack any agave, but larger specimens with broad leaves such as the century plant are particularly attractive to the weevil. How to Prevent Agave Snout Weevil? The best way to avoid agave snout, is to only purchase plants from a reliable source and inspect bare-root for any signs of weevils. You can also use preventative chemical treatments with a spectracide grub control to try and kill the pests before they feed on it. How to Treat It? 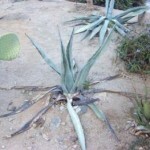 It’s important to treat the affected agave early, in order to save the plant. If you think a plant at your home or office may have Agave Snout, call us for a free consultation about which treatment is best for you, 480-483-8088.